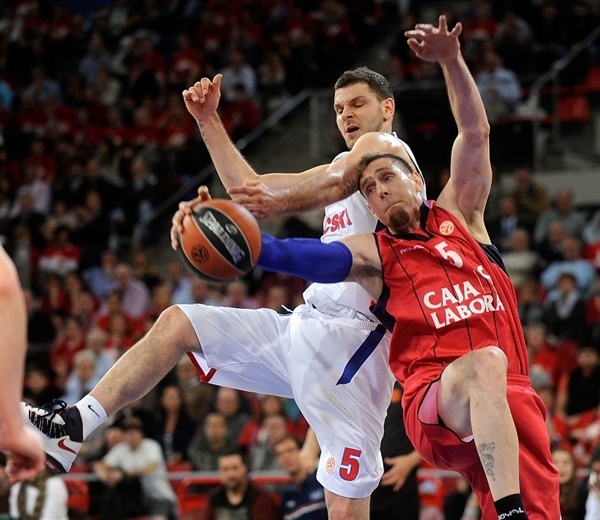 CSKA Moscow became the second team to qualify for the 2013 Turkish Airlines Euroleague Final Four in London after holding off Caja Laboral Vitoria 85-94 on Friday in Game 4 of their best-of-five playoffs series at Fernando Buesa Arena in Vitoria, Spain. CSKA won the series 3-1, clinching its tenth Final Four berth in last 11 years and joining Real Madrid as the only two teams that qualified for London so far. In the semifinals, CSKA will play the winner of the series between reigning champion Olympiacos Piraeus and Anadolu Efes Istanbul. On Friday, no team held more than a 4-point in the first half, but Sonny Weems and Vladimir Micov combined to score 15 points, including three times from downtown, in a 4-16 third-quarter run. CSKA seemed to be cruising, and led 68-83 with less than four minutes to go, but Thomas Heurtel sank three triples to get the hosts within 82-85. However, Milos Teodosic answered with a triple before Weems and Micov sealed the deal. 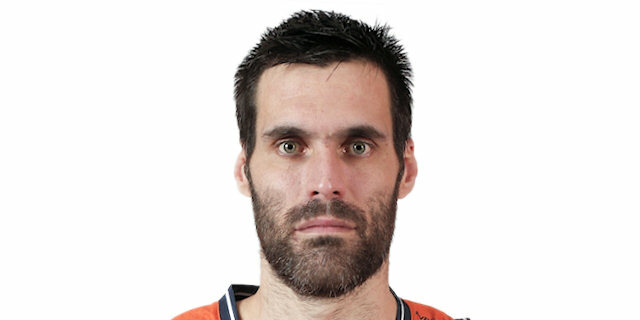 After he was held scoreless in Game 3, Victor Khryapa led CSKA in Game 4 with 19 points plus 12 rebounds. 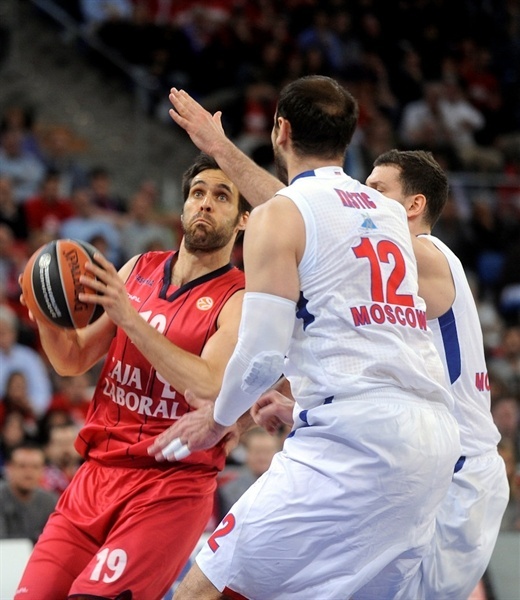 Weems and Nenad Krstic also scored 19 apiece, while Teodosic netted 13 and Micov 12 in victory. For the hosts, Fabien Causeur had 19 points, while Heurtel scored all 17 of his points in the final eight minutes of the game, in the process shooting three-pointers 4 for 4. Fernando San Emeterio chipped in with 15 in defeat. 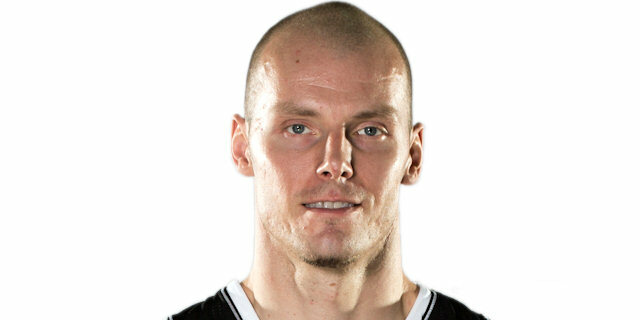 Khryapa started things with a pair of free throws, followed by Maciej Lampe and Kaun trading close-range baskets. After Weems made a driving layup for 2-6, Milko Bjelica sank Laboral's first triple and Causeur's fast break dunk gave the hosts their first lead, 7-6. Causeur added a jumper before Milos Teodosic drilled a triple on the other end. Aaron Jackson, who got his first start in the playoffs, made both foul shots for another lead-change, 10-12, as all CSKA's starters scored in the opening five minutes of the game. Weems and Milko Bjelica traded three-pointers, but Teodosic made a layup and Khryapa made a tough shot for 16-19. After Lampe and Krstic traded baskets from close range, Causeur drove for a layup, but the visitors still held 20-22 lead at the end of the first quarter. Fernando San Emeterio started the second quarter with a fast break layup and added a runner after a spin-move to the tally. Nocioni’s put-back slam gave Laboral a 26-22 advantage, as the hosts held CSKA scoreless for four minutes before Khryapa sank back-to-back triples for 28-28. Krstic scored inside for CSKA to regain the lead, but Tibor Pleiss answered right back with a dunk. Midway through the quarter, the visitors started dominating the offensive glass, grabbing 4 offensive boards in a row, but had no points to show for it. The teams kept changing leads, but stayed within a single possession, as Krstic scored twice more inside for CSKA while Nemanja Bjelica dunked on back-to-back possession for the hosts. Theo Papaloukas rounded out the scoring in the quarter with a pair of free throws, giving the visitors a 34-36 halftime lead. 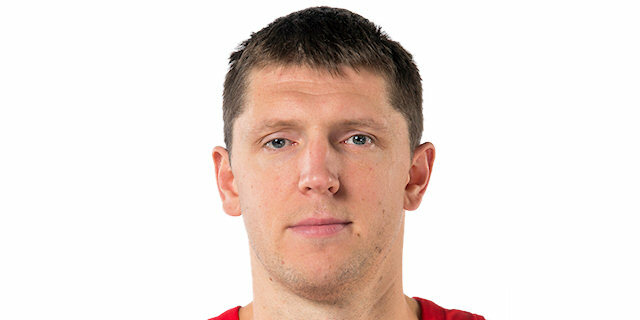 Weems led off the third quarter with a jumper from the right wing, and Vladimir Micov sank a triple. Causeur hit a long jumper, but Weems hit twice more from the right side, a triple and a long jumper for 38-46. With a pair of free throws, Weems brought his tally to 9 points in little over three minutes of the third quarter, and Micov sank a three-pointer from the right corner making it 38-52. After a timeout, Lampe snapped a 4-16 run with a floater, and Omar Cook nailed a triple. Micov scored inside for the visitors, but Causeur and San Emeterio made layups, cutting it to 49-56 and forcing Coach Ettore Messina to call a timeout. With the hosts trying their luck with zone defense, Krstic made a basket-plus-foul, before he and Papaloukas grabbed offensive boards on the next two trips down the floor, extending the lead back into double-digits, 51-63. Causeur answered with a tough jumper-plus-free throw, but Krstic beat the buzzer on a short baseline jumper for a 54-67 lead after 30 minutes. After Sasha Kaun made a dunk to extend the visitors’ margin, San Emeterio and Khryapa traded triples in the opening minutes of the fourth quarter for 59-72. After a dunk from Pleiss, Heurtel sank a triple of his own for 64-72, but free throws from Weems and a three-pointer from the left corner from Teodosic gave CSKA more breathing room, 64-77. Emotions ran high after Nocioni’s unsportsmanlike foul on Teodosic and CSKA pulled away to 68-83 with free throws from Teodosic and Krstic, as well as a baseline jumper from the latter. But, the hosts rallied back. On its next four trips down the floor, and with some help from Nemanja Bjelica’s defense, Laboral hit 4 triples, including three from Heurtel. He added an uncontested fastbreak dunk after another steal from Nemanja Bjelica, cutting it to 82-85. However, Teodosic answered with a triple from way downtown with 71 seconds left, silencing the home crowd at 82-88. Heurtel’s layup kept Laboral’s hope alive, but Weems made 3 of 4 free throws after San Emeterio’s technical and Micov’s fastbreak layup for 84-94 sealed the outcome. "Our team gave its best tonight. I’m proud of them and the effort they put on the court till the end despite of all the things that happened. I want to thank the fans for supporting us during this Euroleague journey. Without them we wouldn’t have been able to get so far. We suffered a decrease in our defensive level at the beginning of the third quarter, and I think that we started to lose the game there. " "It was a very tough game. We managed to make it to the Final Four once again and I want to thank my players for the big effort they put throughout the season to achieve this. I want to congratulate them, the club and the fans that supported us at home and also on the road. It’s going to be a great experience to be back in the Final Four. " "We made a great effort but it was useless. I don’t feel like I can talk. Losing like this makes me want to cry." "I cannot feel satisfied by the series we played. We hoped to force Game 5 and we couldn't ." "We wanted to have played like this in the previous game, but it did not happen. It was very disappointing, talking about our offense, and also our defense was under our level. It wasn’t like it was in the first two games we played in Moscow. Tonight it was different, we were able to raise our level. You know when you play in Vitoria that you must expect a hard game, with lots of support from their fans, as they wanted to bring the series to game 5 back to Moscow, but we played solid defense, and even though we struggled in offense in the first half, our defense made the difference and allowed us to build a good lead in the third quarter, when we started getting the shots. We needed to play with patience the full game and not to get disappointed with mistakes in offense. It’s always a great experience to play in a court like this. There aren’t many arenas with such great support from the fans like this, maybe a couple in Greece, Turkey and also Spain, of course. They support really hard and very aggressive. We understand them and it’s a very good thing for Caja Laboral to be able to count on fans like this."